This crescent view of Earth's Moon in infrared, blue-green, and red wavelengths comes from a camera test by NASA's Mars Reconnaissance Orbiter spacecraft on its way to Mars. The mission's High Resolution Imaging Science Experiment camera took the image on Sept. 8, 2005, while at a distance of about 10 million kilometers (6 million miles) from the Moon. 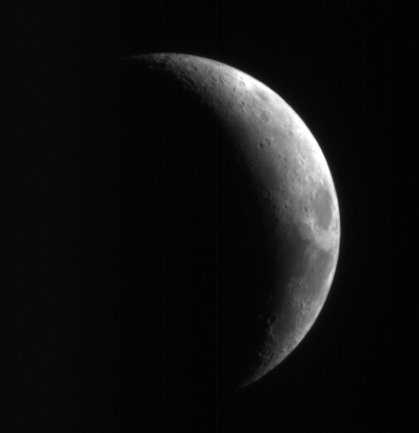 The dark feature on the right is Mare Crisium. From that distance, the Moon would appear as a star-like point of light to the unaided eye. The three images of the Moon in different colors all look similar because the Moon has an overall grey color, but further processing will reveal the subtle color variations. The test verified the camera's focusing capability and provided an opportunity for calibration. The spacecraft's Context Camera and Optical Navigation Camera also performed as expected during the test. The Mars Reconnaissance Orbiter, launched on Aug. 12, 2005, is on course to reach Mars on March 10, 2006. After gradually adjusting the shape of its orbit for half a year, it will begin its primary science phase in November 2006. From the mission's planned science orbit about 300 kilometers (186 miles) above the surface of Mars, the high resolution camera will be able to discern features as small as one meter or yard across.